Here are some cool nebula pictures taken by the Hubble Space Telescope. This is a cool picture of the Omega Nebula, which is also known as the Swan Nebula, or M 17. It’s located in the constellation Sagittarius, located about 5,000 light-years from Earth. This is picture of the Cat’s Eye Nebula, a planetary nebula in the constellation Draco. This used to be a star similar to our Sun, but then it died and became a white dwarf, puffing off its outer layers into space. This is the Carina Nebula, a star forming nebula in the Carina Constellation. It holds Eta Carinae, one of the most massive stars ever discovered, which is expected to detonate as a supernova in the next few hundred thousand years. This is the Bubble Nebula, also known as NGC 7635. This nebula glows because of a hot central star that’s providing radiation and exciting the nebula atoms. This is a picture of the Trifid Nebula taken by the European Southern Observatory. This nebula was cataloged M 20 by Charles Messier as part of his famous catalog. It’s called the “Trifid Nebula”, because it appears to be broken up into three parts. We have written many stories about nebulae for Universe Today. Here’s an article with more details about the Trifid Nebula, and here’s an article about planetary nebulae found around heavy stars. If you want more cool pictures of nebula, you should check out the source. Go to the Hubble Space Telescope page on nebulae. We have recorded an entire episode of Astronomy Cast that’s just about nebulae. Listen here, Episode 111: Nebulae. Looking for a picture of Earth from Space? Here is a collection. Here’s a spectacular image of the earth with the full coverage of the Pacific Ocean. This image was obtained by the Galileo spacecraft on December 12, 1990 while on its way to planet Jupiter 1.6 million miles from the Earth. This is a spectacular full view of our planet earth. It was taken by the Apollo 17 during their journey to the moon in December 7, 1972. The south polar ice cap of Antarctica can be clearly seen in the image. This region constitutes 70% of the world’s freshwater. This photo of the earth was the first to feature the south polar ice cap. Here’s an image of different storms and hurricanes forming at the Atlantic Ocean. This image was generated using the data provided by the Geostationary Operational Environmental Satellite (GOES) satellite on September 3, 2008. Here’s a nice view of the earth particularly focusing on the Western Hemisphere. Earth is the third planet from the sun and is the only place in the universe where life is known to exist. This is a nice view of the planet earth and the moon in one frame as seen from the Galileo spacecraft 6.2 million kilometers away. Here’s a picture of Earth from Space as well as the Moon. These images were taken separately and then stitched together on computer to show them together. This picture was taken by the Space Shuttle, and shows the Earth from high orbit. You can see how the clouds rise up into the atmosphere. Here’s another picture of Earth. Again, this was taken from the space shuttle. This is a satellite map that shows all of the Earth. 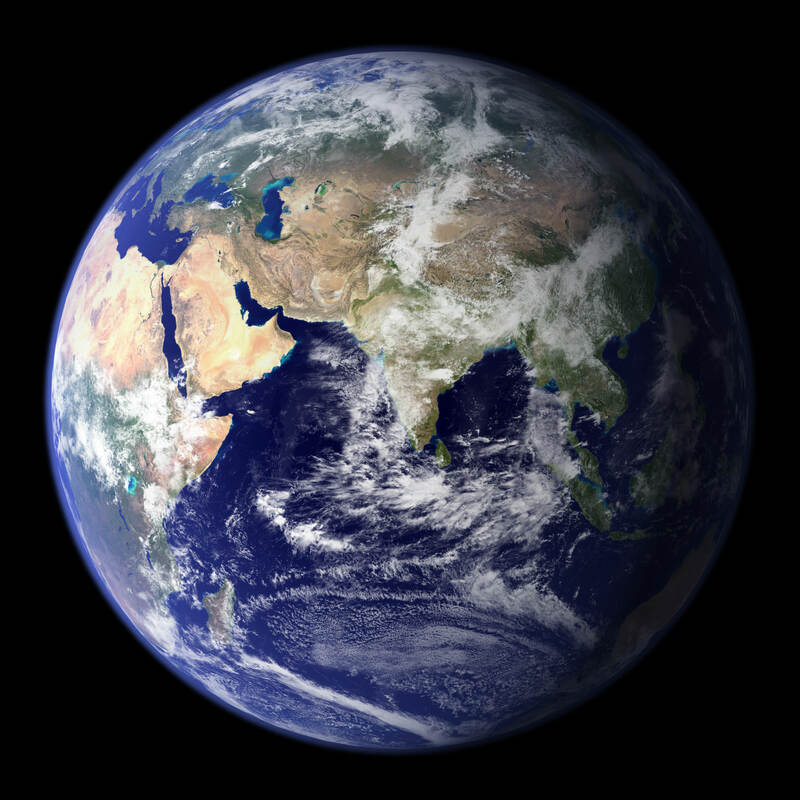 This is the classic “Blue Marble” photo of Earth. Here’s a photo of the entire Earth, seen from space at night. You can easily see cities and towns in North America, Asia and Europe. And you can also see vast regions of the Earth which are totally dark. Here’s a photo of the city of Chicago at night. It might look upside down, but that’s because it was captured from the International Space Station as it was passing over the city. This night space image shows the city of Tokyo at night. The blue green glow in the photograph comes from the mercury vapor lighting that lines the streets of the city. This space pic from night shows the city of London. You can see the brightest areas are the most densely populated, and the less dense areas are dimmer. You can see the ring road that surrounds London, as well as the path of the Thames river. Here’s one of the brightest cities in the world. It’s Los Angeles from space, seen at night. Here’s an amazing picture of the earth in crescent. This breathtaking view of our planet was obtained by the Geostationary Operational Environmental Satellite (GOES-8) on June 22, 1996. GOES is primarily assigned in monitoring the weather particularly the development of storms and hurricanes in different parts of the earth. This is an amazing still photo of the earth taken during its transition from day to night. This beautiful photo was taken from the International Space Station in June 2001. This spectacular image of the crescent earth was captured by the Optical Spectroscopic and Infrared Remote Imaging System (OSIRIS) camera on board the Rosetta spacecraft in November 2007. Here’s a nice view of Houston, Texas at night as seen from the International Space Station on February 28, 2010. This photo was taken by the crew member of the Expedition 22 mission. Houston, Texas is the world’s energy capital. Here’s an image of the Manicougan Reservoir situated at Canadian Shield in the province of Quebec. This was taken from the International Space Station in December 1983. Manicougan Reservoir covers an area of about 1,942 km². This image of the sunset on earth was captured from the International Space Station by an Expedition 13 astronaut in August 10, 2006. Expedition 13 mission was able to accomplish a total of 2,886 orbits. This photo shows the Central Gulf Coast obtained from the International Space Station by an Expedition 11 astronaut in September 10, 2005. This is a photo of the eye of Hurricane Alberto taken in August 19, 2000 during the Terra orbit 3571. Hurricane Alberto is a Category 3 hurricane in the Atlantic that lasted for 19.75 days. This beautiful view of the eye of Hurricane Emily and the moon was captured from the International Space Station in July 16, 2005. Hurricane Emily is a Category 5 hurricane having a maximum wind speed of 160 mph. 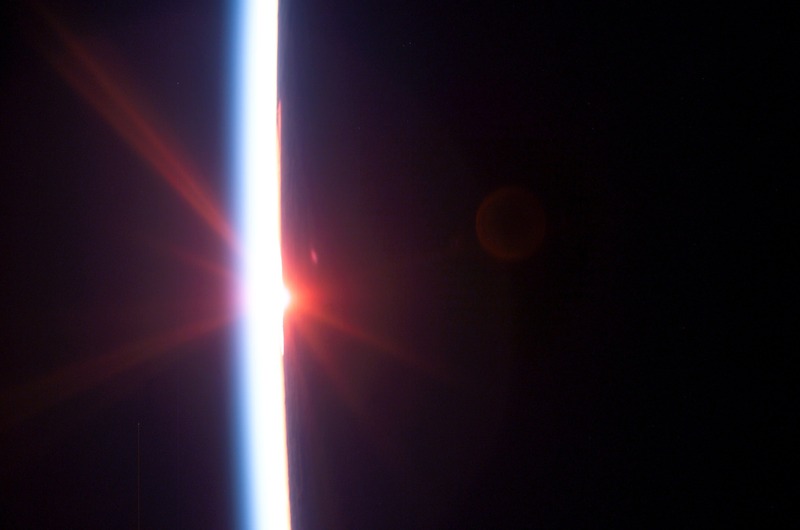 This photo of the earth’s atmosphere during sunrise was taken in July 2005 by a Discovery crew member during the STS-114 mission. STS-114 mission was the first Return to Flight mission after the unfortunate loss of the Columbia space shuttle. This image of the earth was taken from the space shuttle Endeavor during the STS-59 mission in April 12, 1994. The image particularly shows the shuttle’s payload bay and the region of the Andes Mountains in Bolivia. Here’s a stunning image of the Sinai Peninsula and the Mediterranean Sea as seen from the space shuttle Atlantis. A crew member of the STS-125 mission took this photo during the mission’s first flight in space. Here’s a unique photo of the earth’s atmosphere taken by the crew members of Atlantis’ STS-125 mission during its preparation for landing on May 20, 2009. Here’s a great view of the Aurora Australis taken in May 1991 by the STS-39 crew member onboard the space shuttle. We have written many articles about pictures of Earth from Space for Universe Today. Here’s a story about the Earth from space at night, and here’s an article about images of cities from space. You can get many more images of Earth from space at NASA’s Earth Observatory website. We have recorded a whole episode of Astronomy Cast about our planet. Listen to it here, Episode 51: Earth. Here are some cool pictures of islands… from space! This is a picture of South Georgia Island, one of the southernmost islands in the world, off the tip of South America. It was used as a whaling base and now has no permanent inhabitants, other than some scientists. In this picture, taken by NASA’s Terra satellite, the entire island is covered in snow. Here are some more island pictures. This is a picture of Surtsey Island, captured by the IKONOS satellite. This volcanic island is one of the newest in the world, breaking through the surface of the ocean in 1963. The volcanoes that formed the island erupted for about 4 years and then stopped, and now erosion from the ocean is wearing it back down again. Next in our pictures of islands is Ascension Island. You can see the airstrip down on the lower right side of the island, and a cinder cone above it. The northern part of the island has lava flows and you can see individual clouds above the island. Ascension Island is one of the space shuttle’s alternative landing sites. Here’s a picture of a completely man made island. This is Palm Island, off the coast of Dubai in the United Arab Emirates. Now complete, it has palm fronds surrounded by a circular breakwater. There will eventually be more than 100 luxury hotels, marinas, water theme parks, and many houses. This is a picture of Akpatok Island, in Northern Quebec, which is accessible only by air. The picture was taken by a Landsat satellite. We have written many articles about islands for Universe Today. Here’s an article about the biggest island on Earth, and here are more pictures of islands from space. You can find many more pictures from NASA’s Earth Observatory site. We have recorded a whole episode of Astronomy Cast just about our planet. Listen to it here, Episode 51: Earth. Tsunamis are some of the most devastating natural disasters. The recent Boxing Day Tsunami was generated by an enormous earthquake off the coast of Indonesia on December 26, 2004. Coastlines in Asia were inundated with enormous tsunami surges, killing more than 200,000 people. Here are some Tsunami pictures capture by satellite that show before and after images of the regions affected by the tsunami. This photograph shows the devastation that happened in Sri Lanka on December 26th. This picture was taken by the DigitalGlobe Quickbird satellite, and shows how the whole coastline was inundated with water. Perhaps the most devastation from the tsunami occurred in Indonesia. This is an image of the town of Lhoknga, Indonesia. It was completely wiped off the map by the tsunami, except for the white mosque in the center of town. This photograph, captured by NASA’s Terra satellite shows how the whole northwest coast of the island of Sumatra was hit hard by the tsunami. It looks like the vegetation was just scraped back from the edge of the island. We have written many articles about the devastation from the 2004 tsunami. Here’s an article about how GPS could be used for a tsunami warning system. You can get many more tsunami pictures from NASA from their Earth observation page.